Every Australian has the right to seek justice under the law. But this principle counts for nothing when you can’t afford lawyers’ fees, are unable to deal with the complex legal system alone and are unable to access any assistance. It is estimated that 8.5 million individuals face a legal problem every year but more than half don’t seek legal assistance. It is little wonder. The Productivity Commission estimates that only the most disadvantaged 8 per cent of Australian households are eligible for legal aid, meaning government-supported legal assistance is unavailable to thousands of people living under the poverty line. So many turn to Australia’s Community Legal Centres (CLCs) – but after decades of funding cuts, these not-for-profit organisations are forced to turn away 170,000 people a year, due to insufficient resources. It was following a meeting with the heads of major CLCs in 2016 that Sam Flynn, creator of a web app to help Melbourne commuters called myki fines; Tom Dreyfus, Columbia Law School LLM candidate and son of shadow attorney-general Mark Dreyfus; and RMIT graduate and AI expert Kirill Kliavin joined forces to figure out if technology could help the dire situation. The result is Josef, a platform for CLCs, legal firms and enterprise to create legal chatbots to assist clients with their legal problems. “If you have a sore tooth, you go the dentist. If you have a broken car, you go to a mechanic. If you have a legal problem, most people don’t go and see a lawyer,” Flynn says. 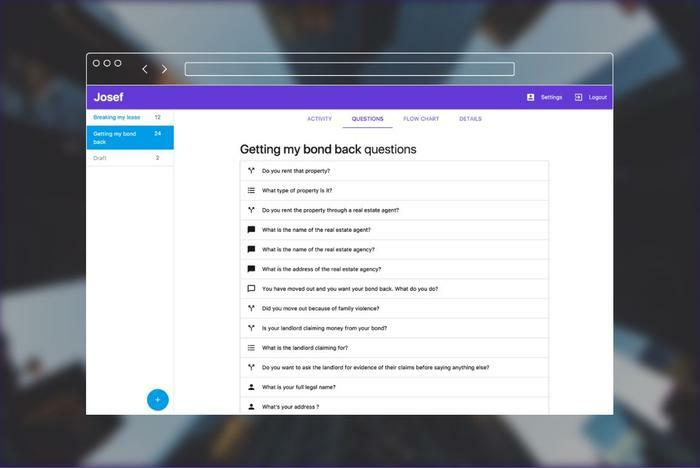 The Josef platform – named after the protagonist of Franz Kafka’s The Trial; “such a law student name” Flynn jokingly admits – has been built from scratch by the trio, and allows clients to stand up chatbots by inputting questions which users can answer with text, picking from a drop down menu, by uploading documents or with a yes/no. The client can easily build a flow chart so the appropriate questions are asked. Josef also allows for the responses to be used to create documents on behalf of the user based on their inputs. “The builder allows any legal organisation or community legal centre to build their own chatbot based on their area of expertise and then once they’ve built they can launch it themselves without the need for a developer or any coding experience,” Flynn explains. “The law is constantly changing so when people go out and pay a developer to build them a chatbot they then need to pay the developer again in order to change the content. Whereas this allows them to change the words, relaunch, and the chatbot has been updated,” he added. The startup’s first live chatbot – Health Complaints Assist – went live today, built by Polaris Lawyers in Melbourne. It helps people to make complaints against any Victorian health care practitioner be it around misdiagnosis, unnecessary and expensive prescriptions, or unexplained and painful side effects of treatment. The chatbot uses a user's responses to questions to draft a letter or email for the user to send to their health services provider. “When something goes wrong with a person’s health care, it can be difficult for them to know where to turn or how to respond,” said Polaris’ Nick Mann who built the bot. “We built the health complaints assist tool to help patients navigate a process that can be intimidating and confusing,” he said. 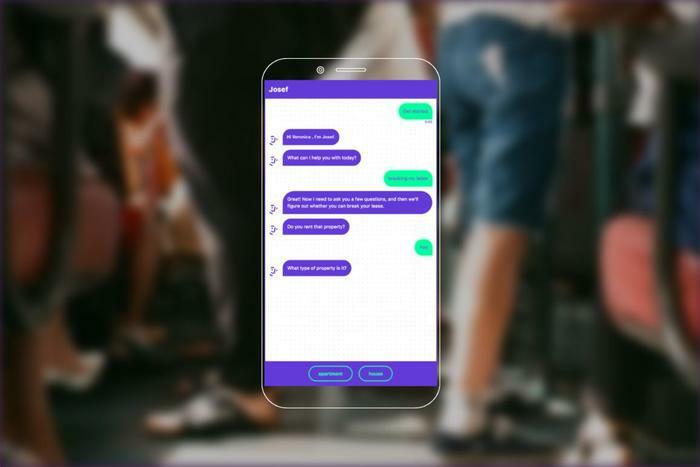 Tenants Union of Victoria is currently developing a tenancy chatbot that will automatically draft letters and forms for renters and another CLC is planning to build a chatbot to assist with legal issues around domestic violence. A Josef based chatbot is also being used within a New York fintech firm to handle internal legal inquiries from employees. Flynn expects private law firms to offer the public chatbots to cover areas that aren’t high value to them but that will help build relationships with the community and potential customers. There is also the potential for clients to monetise the chatbot at different steps for example, where a user pays for a document to be produced. The chatbot format lends itself well to legal assistance, Flynn says. “It allows for more complex logic. The myki fines site was great but that was about quite a simple area of the law, and so what we’re trying to tackle now is very complex areas of the law,” he says. “Tenancy dispute for example is incredibly complicated and so by having that interactive nature you can apply a lot more logic to the situation and you can also capture information from the user that you can’t in a ‘if yes then this, if no then this’ structure,” Flynn adds. Despite the huge commercial potential of Josef, it is helping people that really drives Flynn and his co-founders. “The legal industry doesn’t work like it should. If lawyers want to be professionals, in the old sense of the term, then they need to be there to help people when they have a legal problem. And at the moment it just doesn’t work like that,” he says.